Serving soup over the holidays? Here's an elegant recipe to delight your guests. Potimarron is a cross between a pumpkin and a butternut squash with chestnut undertones. 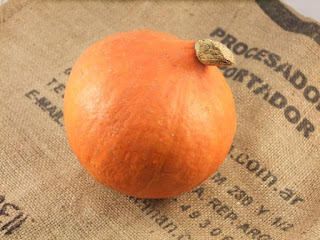 It is sold in the US at this time of year as "Red Kuri" squash. The recipe is adapted from a pumpkin soup online post by Yokam Ottolenghi. A woman in the 'Comment Section' wrote that she substituted Potimarron for pumpkin, and worried that her traditional French neighbors wouldn't be pleased. "However," she wrote, "the soup was a massive success, and the crunchy but sweet seeds were superb and lifted the soup to another level!" As an added bonus, prepare everything a day ahead, then reheat and assemble to serve! 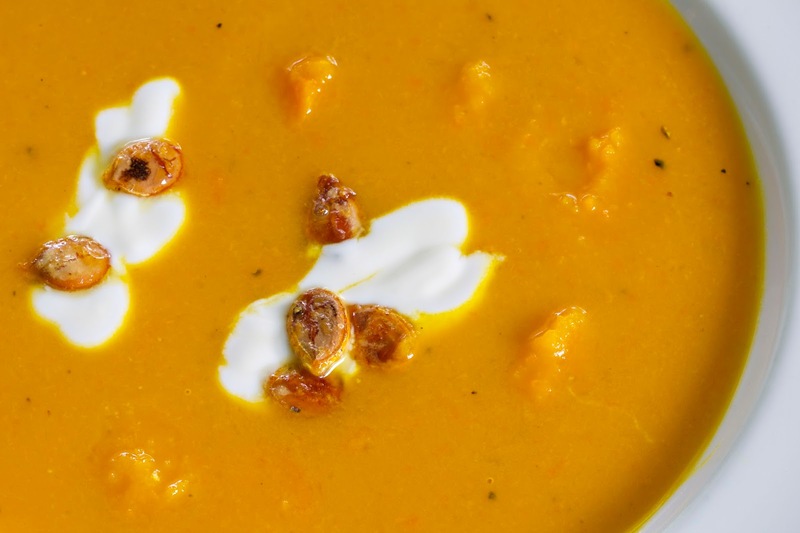 See recipe here for Yotam Ottolenghi's post "Pumpkin, Saffron & Orange Soup with Carmamelized Pumpkin Seeds." Substitute Potimarron squash for the pumpkin, olive oil for sunflower oil for baking the seeds, and Kite Hill Artisan Almond Milk Yogurt (or other non-diary yogurt) for the crème fraîche. Bake the seeds for about 30 minutes rather than 12-15. For a short video on how to peel the squash, see YouTube here.